Abstract—The optimal and accurate detection result of two-dimensional electrophoresis gel (2DEG) image is necessary for accurate diagnostic of diseases. In this paper, we proposed a novel auto-detection algorithm for accurate detection of protein spots which do not required complicating parameters. The method requires copies of the original image to be represented as binary images in different thresholds ranging from 255 to 0. The binary images are used to select suitable states of the protein spots which were merged so that the spots are enhanced and easy to detect. The method is simple and heuristic. The proposed method easy to use without requiring any parameter and useful in applications that are feature oriented, such as proteomics, medical images and others with similar requirements. Index Terms—Two-dimensional electrophoresis gel (2DEG), protein spots, detection, merging. S. Y. Chen is with Hung Kuang University, Taichung 443, Taiwan (e-mail: csy731@sunrise.hk.edu.tw). T. S. Chen and J. Chen are with the National University of Science and Technology, Taichung, 404 Taiwan (e-mail: tschen@nutc.edu.tw, jeanne@nutc.edu.tw). W. Hong is with Yu Da University, Miaoli, 361 Taiwan (e-mail: wienhong@ydu.edu.tw). H. F. Tsai is with Chung Shan Medical University, Taichung, 402 Taiwan (e-mail: HFtsai@csmu.edu.tw). M. L. Hsieh is with Tunghai University, Taichung, 407 Taiwan (e-mail: mhsieh@thu.edu.tw). 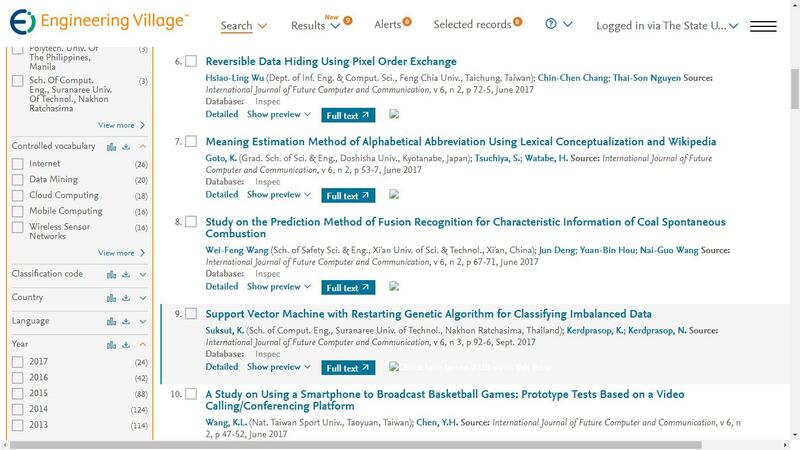 Cite: Shu-Ying Chen, Tung-Shou Chen, Wien Hong, Jeanne Chen, Hui-Fang Tsai, Mingli Hsieh, and Chun-Wei Tsai, "Automated Subspots Acquiring and Merging Detection Algorithm for 2DEG Images," International Journal of Future Computer and Communication vol. 1, no. 1, pp. 44-46, 2012.